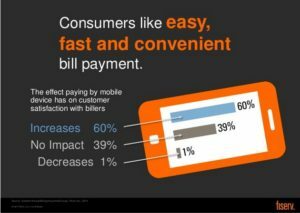 According to a Fiserv survey of consumers, 60% of payers like ‘easy, fast and convenient bill payment’. Waiting on hold or for a practice to open and take a payment call does not qualify. Improving revenue cycle management starts with making payments easy. That also leads directly to improving the patient experience. Consumers report a 60% increase in customer satisfaction when paying by mobile device. That is an increase in satisfaction when paying their bill. See the rest of the Fiserv slides here. Keep in mind, most new bank accounts do not come with a paper check book, they come with debit cards. Same for HSA and self directed accounts. Collect email addresses when patients are in the office. Select a billing vendor that can produce emailed statements. Select a communications system that can ‘listen’ to a text reply. Send frequent reminders to past due accounts early. Offer payment function outside of patient login. Make sure patients can see their statements online. Make sure that your patients can easily find the amount due and that claims are paid. We find that practices that implement more online functions, recalls, reminders, online patient registration, bill pay, patient diaries, and surveys also increase utilization by their patients. When your portal is more useful, you will find more patients using your portal. Practices need to collect more from patients than ever before. Patients are saying to make it easy. Complete both with an integrated system from Micro Office Systems. See our online services here.